Welcome to my first ever one of my "Obsession Series"! You can read more about what this is I'm my previous post! So, I'm currently obsessed with Facemasks. My love for Facemasks came strongly rushing back to me when I was in Hong Kong a month ago. Skincare is especially popular I'm Asia and I was quickly persuaded by "pore reducing", "skin tightening", "skin clearing", "skin whitening" masks. I could go on with the list that facemasks claim to deliver. I've been obsessed with water based sleeping masks ever since I tried out the Lanèige water sleeping pack. If you're not familiar with water based sleeping masks, they are basically a light gel like formula that you apply before bed and wake up with a supple, clear and fully moisturised face after rinsing it with water. Sounds good? 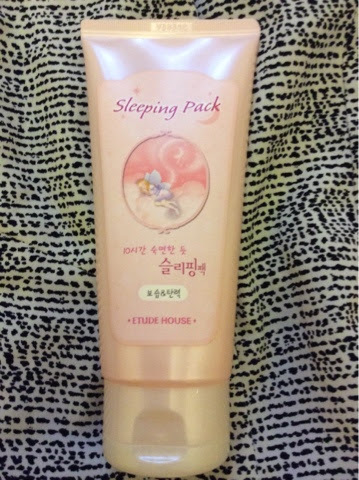 Étude house is a very popular yet inexpensive Korean cosmetics brand. Their packaging and overall brand image is cute and girly - perfect for packaging suckers like me! This mask was the first ever product I tried from them and boy was I pleased I took this step! After reacting very badly to some face products from another Korean brand, Skinfood - I was completely put off from trying new products for years and stick to the same skin are routine to avoid another major breakout! My night time regime would involve washing my face and then applying toner to my face, before applying a generous pea sized amount of the mask all over my face and neck. It has a relaxing rose scent to it which makes it very relaxing to apply. I have noticed clearer skin since I started using it and the application of my makeup looks much more flawless the day after!